This is a Targeted offer. 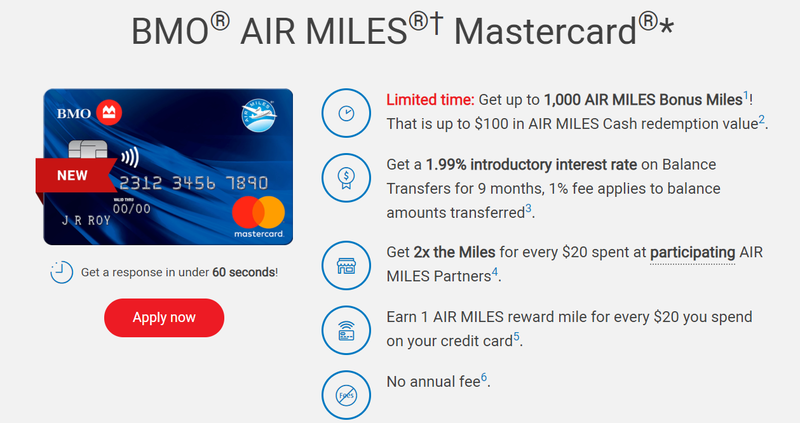 You can get up to 1000 Air Miles bonus when you spend $1000 in first 3 months from the date you open a new BMO Air Miles MasterCard. The general BMO website offer for this card is only 800 Air Miles. I received this 1000 Air Miles offer from an Air Miles communication email. You can check your mailbox to see if you receive this offer or not. 1,000 AIR MILES Bonus Miles offer is limited to new accounts. Applications must be received between January 15, 2019 and October 31, 2019. Existing BMO AIR MILES Mastercard customers who cancel their card during the Offer Period, and existing BMO Mastercard customers who transfer into this product during the Offer Period are not eligible. 500 Bonus Miles will be applied to your AIR MILES Collector Account within forty-five (45) days after your first card purchase. Additional 500 Bonus Miles will be awarded when you spend $1,000 in net card purchases (less refunds and excluding cash advances, cash-like transactions, interest charges, fees, credit or debit adjustments) in the first three (3) months from the account open date and will be applied to your Collector Account within forty-five (45) days after qualifying. Limit of one Bonus Offer per Collector Account. If you cancel your card within ninety (90) days of opening your account, the Bonus Miles will be cancelled. This offer may be changed, extended or withdrawn at any time without notice. This is an exclusive online offer and only available from BMO selected websites. Eligibility restricted to: 1) any airmiles.ca communication, 2) internal Sobey’s employees via intranet, and 3) any BMO communication. It is not available in BMO branches, BMO.com, or the Customer Care Centre.